Piper is learning to count, and for the most part, she’s got the whole 1-10 thing down…Except for the little detail of “ten” itself. She counts quickly and with pride, building anticipation when she gets to the higher numbers- seven..eight…nine………[big dramatic cliffhanger moment]…and then explodes with the big finish: ELEBEN! (yes, “eleben”. In addition to numbers, we’re still working on our “v’s”.) So she’s close, and frankly, to excited with herself for me to break her spirit too much with corrections. I usually nod and say, “Close! It’s TEN!” in as excited a manner as possible. Why do I tell you this? (besides my blanket assumption that everything my kids do/say is irresistibly adorable and needs to be shared). Well…because I, like Piper, have a little bit of an issue with counting- at least when it comes to baby milestones. If you’ve been following along, I counted off Fin’s first few months quickly and with pride, but then as we got to the higher numbers- seven..eight…nine………My pace slowed, and the dramatic pauses increased. I managed to make it to TEN…..and then……[big dramatic cliffhanger moment]. I should have been building to my big finish of twelve, somehow got stuck on silly “eleben”. 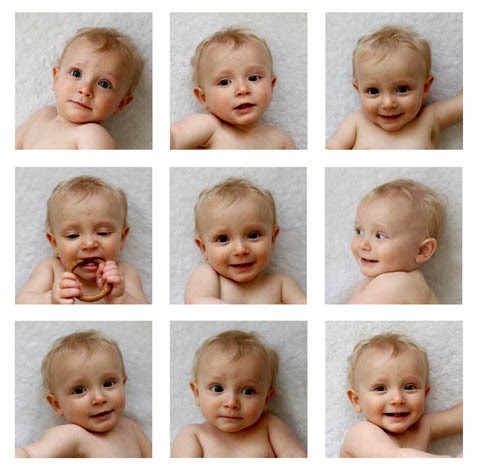 So in better late than never fashion, (aka, Courtney’s motherhood milestone mantra), I present Fin’s 11 month Faces. Only one month late. It’s taken me a while to compile the photos, as they languished on my camera card for weeks (don’t ask me about my USB port. We’re in a fight), but the problem runs deeper, as my monthly diary to Fin was suffering as well. I attempt to write bulleted letters to her each month, with highlights of what she’s learning and doing at each stage, but it’s been a struggle to keep up. It’s discouraging sometimes to feel like she’s off and running (recently, almost literally) and I’m chasing her with film and a notebook, trying not to miss anything. And while I juggle my pen and my camera, (or more accurately probably, just my iPhone), I’m trying to keep my hands free to hold, and comfort, and catch, and encourage, and support her. I’m her mother and her biographer, and her playmate, and her statistician…always running out of hands, time, and brain cells. But we keep on keeping on (my other motherhood mantra, so it seems), and I give myself perspective pep-talks, knowing (hoping) that years down the road, she won’t be critical of how often I journaled, or how timely I posted updates. She won’t lament that the photos from month three have some rough lighting, or that month four’s list is a little sparse. She won’t compare me to a mythical Pinterest conglomeration of nostalgic scrapbooking perfection. She won’t ask me where her bronzed baby shoes are (nowhere) or what I did with the footprint art daycare constantly sent home (I took pics. I think…) She’ll probably forgive me (or thank me) for not plopping her on a chair every month and photoshopping pithy saying on a fake wall. I don’t think that she’ll be nearly as hard on me as I am of myself. If I’m lucky, she’ll understand, and just be thankful that I tried. And someday, when she has babes of her own, she’ll know that trying is what we mamas do. Every single day. You are a whole lotta things...and I'm working on recording as many of those traits as possible, but for now- let's talk about one that's pretty special: You’re really understanding when it comes to how I record your milestones. Ok. I know that’s cheating because you don’t even know what a milestone is, but I have so much silly mom-guilt about this. I started the monthly lists when your sister was born, and though I don’t have a perfect track record with hers either, it’s getting harder and harder for me to keep up as time goes on. It might be a second kid thing. It might be that we moved. Or it could be the new job. Really…I think it’s all of those things. But I hate to think that I might be shortchanging you somehow, or missing recording such important memories. I don’t want you to ask me someday when you crawled, or what your first word was, and have me look at you with a blank stare while I fail to remember. And I definitely don’t want to rely on your baby book (slash blog) for the info, only to look it up and find nothing there. So I try to jot things down whenever I get the chance, but it’s such a struggle. Not because I don’t like writing about you- actually, it’s quite the opposite. I adore gushing about you. So much so that when I sit down to write these lists I my fingers can’t even keep up with all the things I want to say. I try to at least get the highlights in there, but it’s tough to do because if time weren’t a factor- each month’s list would include 172 items. Truly though, if I’m honest- I tend to be too hard on myself. I compare what I’m doing with a imagined hybrid of the best scrapbooker/photographer/writer moms out there, and constantly think that I’m not doing enough. But I can promise you, that I marvel at you…truly marvel…every day. In the beginning it was actually all day every day, but now you’re on the move and tolerate slightly less googley-eyed staring on my part. Stop being all lame and weepy, mom…I want to play! So you may fall victim to the second child syndrome occasionally, but I still have a head, heart, and camera phone full of vivid memories of you. You’re not my second kid. Or my youngest baby. You are my chubby legged, wide-eyed, sweet voiced, cuddle-bug, one of a kind Fin Fin, and I love you so specifically, and so deeply, that there will never be enough words to describe it. 1. 2. 3. 4. 5, 6, 7, 8, 9, 10. Please don't be so hard on yourself, my mother put entries for my brother in my baby book. 50 years out, we find it very funny, especially my brother having children of his own (which I helped raise).